Why did it state “1919” when the Armistice came into effect on November 11, 1918? In part, the answer is that the official peace did not come until the Treaty of Versailles was signed midway through 1919. The later date also correctly recognized that the Armistice did not mean an immediate end of service for many of Canada’s overseas forces. Following much debate in Parliament it was decided that all Canadians should be repatriated through England and the logistics for the repatriation of more than a quarter million soldiers was complicated. [iii] Most Canadians were sent to demobilization camps in England and Wales to await their transportation to Canada for discharge – including camps in Witley, Ripon, and Kinmel Park, where some soldiers began riots out of frustration with the delayed and apparently inequitable repatriation process. 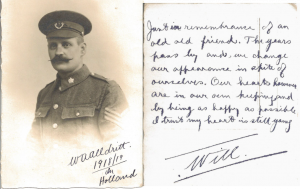 [iv] However, prisoners of war exchanged to Holland, including William Alldritt who had been captive since April 25, 1915, were amongst those who were retained to work into the early months of 1919. While there was much debate as to whether to return soldiers to Canada on a “first over, first back” principle, decision-makers in the Canadian government were persuaded that it would be desirable to repatriate soldiers by unit, rather than by service seniority, to maintain an infrastructure. Thus, many of those who currently found themselves providing support services – clerks, cooks, etc. – would be last to return to Canada. Many of the “Old Originals” who had enlisted during the first days of the war were amongst this number[v]. Photo included in Alldritt’s August 21, 1918, letter to Ethel, noted as being taken at their front door. Sgt. Alldritt back row, left. Sgt-Maj. Stewart, who was repatriated due to an injured left hand, is noted as seated front row, centre. Last week I did not get a minute in which to write but today I must send at least a note. 10 days ago I was sent down here to help look after the boys arriving from Germany. Last week all the boys from The Hague went to England and left us here for I don’t know how long, it is not nice but very necessary. I work every hour of the day and am so tired at night that I actually fall asleep at my meals. I live at a hotel and am very comfortable except for the everlasting work…. The boys from Germany are in many cases in terrible shape and it is hard to see them in such condition. We do all that is possible and fit them out in Karkie (sic) within 24 hours! Do not worry if I do not write as I am rushed to death. 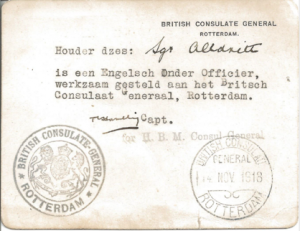 Alldritt’s identity card stating that he was working in Rotterdam on behalf of the British Consulate. By the time the letter reached Agnes it had been opened and re-sealed, noted as “Examined by Censor” – a reminder that, despite the cessation of hostilities, Alldritt’s status as a prisoner had still not changed. 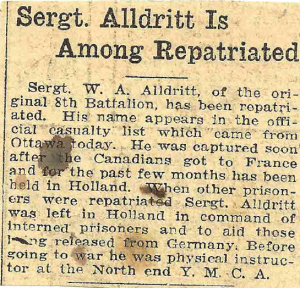 Alldritt’s effort to achieve discharge through the medical board was not successful and he continued to work in Holland until he was finally repatriated to England, arriving at Ripon camp in Yorkshire on January 23, 1919, where he was placed on leave. 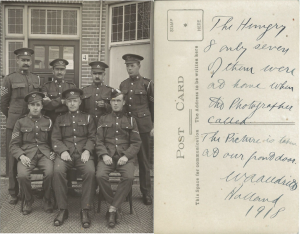 He intended to visit family in England however the years of imprisonment and labour, both in Germany and after his exchange to Holland, had finally taken their toll. He noted in a February 24th letter to Agnes that he had been hospitalized at New End Military Hospital in Hampstead for the previous 3 days with influenza; he remained there until March 11th. On March 12th, he was transferred to 15 General Hospital in Taplow, where he stayed until March 25th recovering from a severe lung infection. In the end, Alldritt did not return to Canada with the rest of his unit – the 8th Battalion – which departed from England on April 26th aboard the Empress of Britain. [xiv] He finally made his way home aboard the SS Caronia, which sailed from Liverpool on May 14th and was discharged from service in Winnipeg on May 26, 1919. As an “Old Original,” Alldritt’s war lasted from September 1914, to May 1919, dates correctly reflected on the Victory Medal he was awarded. P.S. Agnes and William were finally married in June 1920; an event that should have happened years earlier, if not for the war. Uncited newspaper clipping from Agnes’ scrapbook. [i] Alexander J. Laslo. 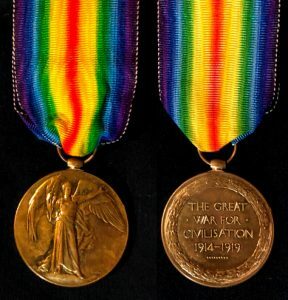 The Interallied Victory Medals of World War I, 2nd rev. ed. (Albuquerque, N.M.: Dorado Pub., 1992). [iii] See Col. Gerald W. L. Nicholson. Canadian Expeditionary Force 1914-1919: Official History of the Canadian Army in the First World War (Ottawa: Queen’s Printer, 1962) and Department of Militia and Defence. The Return of the Troops: A Plain Account of the Demobilization of the Canadian Expeditionary Force. (Ottawa: Government Printing Bureau, 1920). [iv] Desmond Morton. “Kicking and Complaining: Demobilization Riots in the Canadian Expeditionary Force, 1918-19” Canadian Historical Review, LXI, 3, (Toronto: University of Toronto Press, 1980): 334-60. [v] Morton, Kicking and Complaining, pp. 336-7; Nicholson, p.528. [vii] Jonathan F. Vance. Objects of Concern: Canadian Prisoners of War Through the Twentieth Century. (Vancouver: UBC Press, 1994): 76-8. [viii] W.A. Alldritt letter to E.G. Alldritt, from Holland, September 7, 1918. Unless otherwise noted, correspondence is from the unpublished letters of W.A. Alldritt. [ix] For a detailed analysis of the Allied advance prior to, and following the Armistice, see: Sir James E. Edmonds. The Occupation of the Rhineland: 1918-1929. (London: HMSO, 1987). [x] Edmonds, Occupation of the Rhineland, 31. [xi] H.A. Tyrrell private papers, Imperial War Museums, document 16492. [xii] Eds. William S. Duthie, et al., Letters from the Front: Being a Record of the Part Played by Officers of the Bank in the Great War, 1914-1919, Vol. II. (Toronto: The Canadian Bank of Commerce, 1920): 472. [xiii] Capt. N.L. Wells. “Repatriation of Prisoners of War,” The Caduceus: staff magazine of the Canadian Bank of Commerce, Vol. 2/3. (Toronto: June 1921): 12-14. [xiv] The Return of the Troops, 156.